Gonzales is best known for politicized paintings that meticulously re-create pop culture sources using a technique that recalls benday dots. Cheering Crowd is from a series of canvases portraying anonymous crowd scenes downloaded from the Internet. The artist edits the image into a form that can be executed in a restricted palette of one or two colors. The paintings are loosely based on the structure of commercial reproduction technologies but aim to embrace both the abstract and representational nature of these systems. Though Gonzales deftly imitates digitized imagery, up-close his surfaces dissolve into abstracted patterns of carefully rendered brush strokes. Surrounded by a crowd that is both jubilant and ominous, the viewer must question the motivations and circumstances that draw large numbers of individuals together. 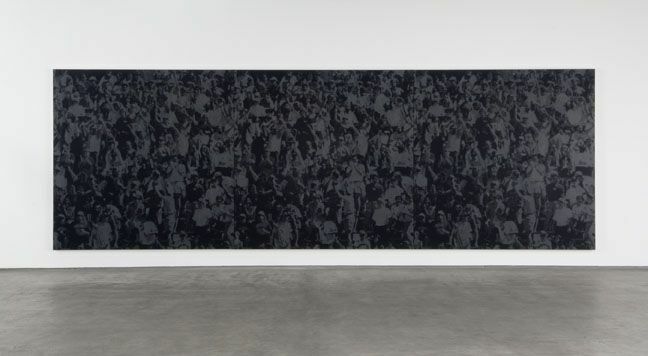 Since 2001, Gonzales has been known for his politically charged paintings based on photographs and documents culled from the archives of American history and popular culture. The artist's subject matter has included such diverse topics as the Hooter's girls, Lee Harvey Oswald, The White House and self-portraiture. Wayne Gonzales was born in New Orleans in 1957. He currently lives and works in New York.